WELLINGTON, New Zealand -- The U.S. Air Force is spending nearly $1 billion to build a radar installation that will help keep astronauts and satellites safe by tracking pieces of space junk as small as a baseball. That is, if global warming doesn’t get in the way. The Space Fence is being constructed on a tiny atoll in the Marshall Islands that scientists say could be regularly swamped by rising seas within a couple of decades as a result of climate change. The salt water could play havoc with the equipment, the scientists say. And The Associated Press found that neither the military nor its contractor, Lockheed Martin, gave serious consideration to that threat when designing the installation and choosing a site, despite warnings from the island nation’s environmental agency. 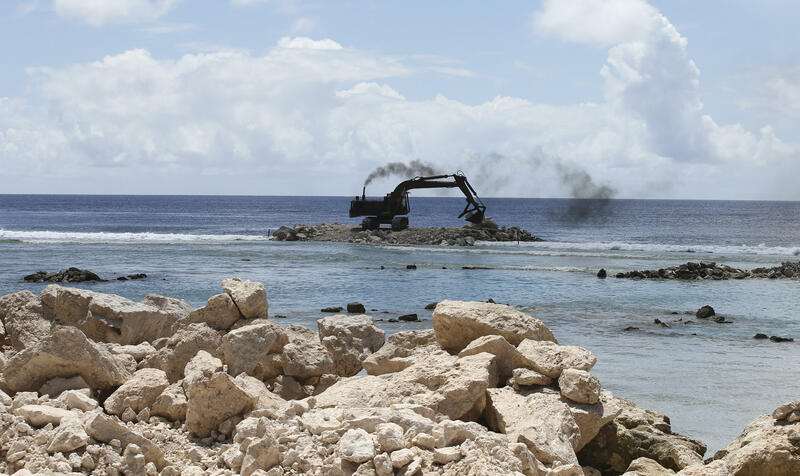 The future “does not look good for a lot of these islands,” said Curt Storlazzi, an oceanographer with the U.S. Geological Survey who is leading a study at Kwajalein Atoll, where the Space Fence complex is being built. Dana Whalley, a civilian who is managing the Space Fence program, said that the radar installation has a projected lifespan of 25 years and that he doesn’t expect sea levels to rise enough over that period to cause a problem. But if necessary, he said, the base could take steps to improve its seawalls. Still, because of budget pressures, military equipment is often used well beyond its projected lifespan. In fact, a key part of the radar tracking system that the Space Fence replaces was built during the dawn of the space age and was badly outdated by the time it was shut down 50 years later in 2013. Midway between Hawaii and Australia, the Marshall Islands are specks of land that typically poke just a few feet above the Pacific Ocean, making them some of the world’s most vulnerable places to rising seas. The U.S. military has a longstanding connection to the islands. Bikini Atoll was used as a nuclear test site after World War II. Kwajalein Atoll, a battle site during the war, is now an Army base, a ballistic missile test site and an important part of the military’s space surveillance network. The growing problem of space debris was highlighted in 2009, when an old Russian satellite smashed into a commercial U.S. satellite, creating hundreds of pieces of orbiting junk. The 2013 movie “Gravity” dramatized the threat to astronauts, who need to be safe from debris whether they’re traveling on the International Space Station or in a rocket. Lockheed Martin won the $915 million Space Fence contract in 2014 and broke ground last year. When the radar system becomes operational in late 2018, it should increase the number of objects that can be tracked tenfold to about 200,000 and provide more precise information on their orbits. The Space Fence installation will include digital transmitters and receivers as well as power and cooling facilities. About 15 people will operate and maintain it around the clock. The military chose the Marshall Islands because the Space Fence works best near the equator. But it means the installation is being built just 10 feet above sea level, or the height of a basketball hoop. Storlazzi said his study explored the point at which storms will cause the sea to wash clear across an island, completely submerging it, at least once a year. He said that’s when an island will no longer be able to sustain most plant or animal life. He examined one island within Kwajalein Atoll and found that it will probably reach its tipping point within a few decades. He said the island on which the Space Fence is being built faces a similar threat. The flooding there will probably damage power cables, sewer lines and other electronics and hardware, he said. The seawater will erode land, he said, and eat away at everything from concrete to cars. “When you get to the point where water is going over the top of the island annually, it will affect a lot of daily life, whether it’s related to the Space Fence or other operations, like moving food around,” he said. The study, funded primarily by the Defense Department, has not yet been peer-reviewed or published. But it paints a much more dire future for the atoll than earlier studies. “We are talking the next couple of decades, not centuries, as previously thought,” Storlazzi said. He said his team studied the underwater contours of the islands and showed how coral reefs will become less effective as breakwaters when sea levels rise. The Marshall Islands base is among dozens of U.S. military sites threatened by climate change. A July report by the Union of Concerned Scientists analyzed 18 military installations along the U.S. East and Gulf coasts. It found that with just a moderate rise in sea levels, 16 could flood 100 times a year by 2050. Last October, strong winds and waves battered Kwajalein Atoll. Ferries were canceled and a dock was damaged, forcing the base to take the unprecedented step of hosting 845 Marshallese day workers overnight. Whalley said the military investigated threats, including ocean flooding, in an environmental assessment of the site before beginning construction. “The over-wash threat, if you will, is built into the government requirements of the site,” he said. Yet that 2014 assessment, which runs over 100 pages and addresses everything from sea turtles to the island’s archaeological history, makes no mention of climate change, noting only that the Space Fence would be able to withstand a small earthquake-generated tsunami. Lockheed Martin did not investigate the issue either. Bruce Schafhauser, Lockheed’s program director for the Space Fence, said the Air Force asked it to design the system to withstand earthquakes but not rising seas. Schafhauser said the responsibility for finding a suitable location for the installation fell to the military. The Marshall Islands Environmental Protection Authority wrote a response to the environmental assessment, describing the U.S. military’s overall treatment of the climate change threat to Kwajalein as “wholly inadequate.” It questioned whether the military was overstating the atoll’s elevation and criticized its reliance on historical data when the problem is rising seas, a more recent phenomenon. Since then, leaders from the Marshall Islands say they have been working with the U.S. to improve environmental standards and ensure climate effects are seriously addressed in future military projects. Whalley said he plans to find out more about the USGS research at Kwajalein.